Camping and playing games goes hand in hand. Our family's favorite camping game is ladder golf but we have lots of others we enjoy as well. 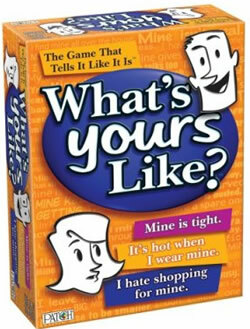 One fun board game is called What's Yours Like. What I like best about the game is that it is fun and different no matter if playing with kids, a group of adults, teenagers, or a group of older people. A "guess word" is picked and everyone except the person in the "hot seat" gets to look at the word. They all then describe that item to the person in the hot seat but they try to be as clever and subtle as possible to prevent that person in the "hot seat" from guessing too quickly. For example, the guess word may be "swimsuit." The clues people may give might be, "mine is tight," "it's hot when I wear mine," and "I hate shopping for mine." To watch a video of the game being played, click here. Click here to see how well you can play the game with a couple sample clues. I'm pretty bad at the game. I played all five sample questions and only answered one correctly.